Is your company using the most visually appealing, affordable, shareable, and quick way to convey information to your target audience? If you’re not using explainer videos, then the answer is no. Most people are visual learners with short attention spans, so this is the best way to get your message across. Explainer videos help you condense complex, technical concepts into a digestible, easy-to-understand, and enjoyable format. An explainer video does just what it says it does — it explains an idea in a simple way. These videos are short, sweet, and usually illustrated with cartoons or 3D animation. They’re a great way to deliver a clear message while showing off a more lighthearted side of your brand’s personality. Click here for a great example of an effective explainer video. Overall, customers like watching videos, Google likes ranking them, and sales teams like the effect of them. If you’re not using explainer videos yet, you’re already behind. These are the Top Five Reasons Why Your Business Should be Using Explainer Videos. 1. Videos increase your conversion rates. This simple fact should be enough to have you storyboarding your first video right now. Research shows that visitors are 144% more likely to convert after seeing a product video than just reading text. This is a huge advantage. Not only are you more likely to convert visitors, but videos also keep visitors on your site longer. Explainer videos do a great service to your customers by making your message clear and keeping your conversion funnel simple. An overload of site content can confuse potential clients, whereas a great video can cut through the clutter in a matter of seconds. 2. They’re good for SEO. Videos pop up in the top 70% of the top 100 search results. That might be because video thumbnails are a lot more appealing to click than anchor text. Plus, Google owns YouTube, so it’s no coincidence that videos are favored over boring websites. And, on top of that, YouTube itself is a major search engine. If you are easily found on that platform, you’ll certainly get a boost. Videos hosted on external sites like YouTube or Vimeo can result in a flood of inbound links for you. Need even more convincing why videos are good for SEO? If your site has a captivating video that visitors just can’t resist, this will keep them on your site longer. Dwell time — the time someone spends on your website — is a measurement Google takes into consideration as a ranking factor. 3. Audiences get to see your brand’s personality. 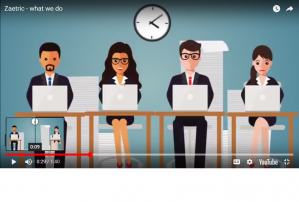 Explainer videos allow you to demonstrate who you are to a captive audience. You have complete control over how you come off. After all, there’s only so many ways to convey tone in written content. Videos allow you to humanize your brand and properly introduce yourself and establish trust. You can even use your animations to relate to your target audience. For example, if your audience consists of B2B corporate clients, animated characters wearing suits and business clothes would make a great fit. 4. Videos are easy to share. Do you use Facebook, LinkedIn, or Twitter? Of course you do. Nowadays, the newsfeed is dominated by video content. Videos are short, fun to watch, and can be shared and even made viral. That’s right, funny cat videos aren’t the only things that go viral — brand videos can, too. A huge benefit of shareability is being easily introduced to a brand new audience and market, boosting your brand awareness. 5. They let you easily explain your product. Nothing makes our eyes glaze over like reading buzzwords and industry jargon. Cut to the chase with explainer videos, as you can show — not tell — what your product does or what makes your business special. It’s an elevator pitch people actually want to experience. 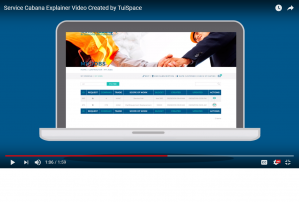 TuiSpace creates professional explainer videos for your marketing efforts. We create videos with 3D graphics, animation, or recorded footage. We can turn your video vision into a sales magnet with viral potential. Find out more about our explainer video services and how we handle every step of the way — from storyboard and script to the voiceover and animation. Request a quote from TuiSpace now!